I must congratulate all those bloggers who post thumbnails of posts done by their participants. It's very hard to get it right! It takes time I must say. So I'm going back to my own post and look forward to your posts by going around and looking at them myself! I hope you'll do the same! Here's a sepia shot that I think you'll like! Please sign Mr. Linky (if it's there) and leave a comment. :) And visit all your Sepia Scenes friends! P.S. : That jewlery is awesome. Is that a real gem stone? I like the different pieces in the bracelet - stones, pearls and metal - lovely! This week, I did a lighthouse at It's A Blog Eat Blog World and Chloe in the sunshine at Purrchance To Dream ~ and on both posts I talk about a new group on Flickr that I created, inspired by YOU, Mary! I'm a beader myself and make a lot of my own jewelry so I'm wondering if your SIL made it. 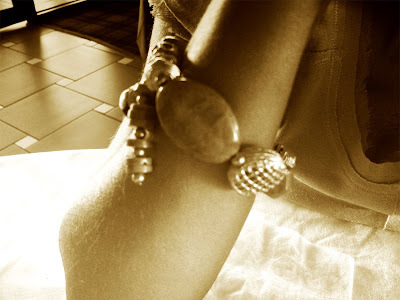 That's a pretty bracelet ~ I also am wondering if your SIL made it. Happy Sepia Scenes Wednesday, Mary! A very romantic photo! Looks lovely in sepia! The ethereal way the arm fades and enhance the jewelry. I vaguely remember having arms that smooth and round in shape. Bejeweled...quite nice, the soft sepia dulls the distractions of gold, etc. Which allows us to admire the form of the stones themselves and the craftsmanship. I really like the new background - It goes very well w/ the sepia theme! Now that IS a bejeweled arm.